or.... 'Honey, I Shrunk the Kids' but in a far better version. Peter Jansen and his Cambridge's science colleagues are invited to Hawaii by 'Nanigen' a company with state-of-the-art equipment that offers jobs to any graduate with innovative undergoing works . Hawaii, good wage and the job of your life... it cannot be better! sun, sand, sea and science, here we go! Of course, something is wrong, otherwise, it wouldn't be a good novel. Eric Jansen, the brother of Peter, works as the vice-president of Nanigen and died in very strange circumstances. With a bit of good instinct Peter will find out that it was not an accident and he will make his move to try to corner the bad guy: Drake, the owner of Nanigen. But he never thought that Mr. Drake would be such a unscrupulous guy. His dramatic and manipulating skills will put Peter and his colleagues in lethal trap. They will be shrink to a half inch size and from there, the survival tour will start. No sun, no sand, no sea... just the science. Little-Peter and his little-friends now will need to escape from Drake, come back to the lab, recover their size and that's not all, they need to find the way to put him in jail. Let's see if all of them are able to come back safe, sound and... sized. And the plot will get better when the insects, the micro-guys, the big bad guy, the police with initiative, some other micro people and an unexpected person (that appears in the last part of the story) come all together. Each part with their own objectives. This fascinating novel can be taken as fabulous adventure to the micro-world, as the funniest biology/chemistry/physics lesson or all together. Action, a lot of well based science, drama and just a little touch of romance, all will be blended to give us a fantastic plot. 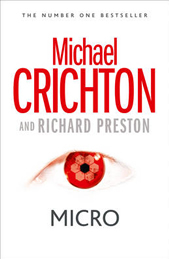 Keep an eye on: of course all the descriptions about physics, entomology, natural poisons, botany and further more that Mr. Crichton leaves in this book. The plot is not complex, however, keeps the reader passing the pages without a break. I used to say that if history were taught just as Ben Macintyre and Keith Jeffery do in their books, lots of students would chose this path. Now I would add that, if biology were taught just as Michael Crichton does, we would have 10 times more scientists working for a better world. Thanks once more to Czerwinski for this fantastic recommendation.